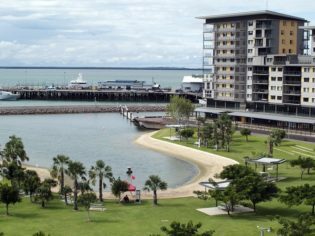 Business traveller Chris Pritchard reveals the best Darwin accommodation, restaurants and attractions for your “Darwin on Business” journey. Bombed in World War II and almost wiped out by Cyclone Tracy in 1974, the tropical Territory capital has long since shed its ambience of a temporary outpost. Its message: we’re here to stay. The fast-growing city promotes itself as our gateway to Asia. High-rise apartments (often bought by investment-savvy southerners) and busy marinas help downgrade a former rough-and-ready image. With 50-plus nationalities, it’s also one of Australia’s most multicultural cities, although Indonesian and other Southeast Asian languages are most commonly heard. Modern Darwin’s sprawl evokes incredulity that only 100,000 people live here. Increasingly visited by foreigners entering or leaving Australia and, particularly in winter, by Australians from southern states, Darwin’s growing business importance is fuelled by mining, agricultural exports and a slew of service industries. From Darwin International Airport, 13km from downtown, take a metered taxi (about $20 to most hotels) or an Airport Shuttle ($10). The grid-pattern downtown is easily negotiated on foot. A broad choice in all niches except ultra-luxury. Downtown’s Mitchell St backpacker zone bursts with cheap-and-cheerfuls. Crowne Plaza is Darwin’s most opulent, with two Holiday Inns and a Travelodge also on the scene. Business-oriented Novotel Atrium (from $109) is exceptional value. A sound mid-market option is Comfort Inn Asti (from $96). Capricornia Hotel Motel (from $60) is 3km from the city in Fannie Bay, hence lower rates. Value Inn (from $105), a good three-star, sits amid centrally located Mitchell St action. Of apartment hotels, stylish-and-spacious Cullen Bay Serviced Apartments (from $225) adjoins Cullen Bay’s after-hours outlets. Redsalt, Crowne Plaza’s flagship restaurant, is flawless for business entertaining, with an emphasis on grain-fed beef and barramundi. With more time (10min by cab), try Yots on Cullen Bay marina’s restaurant row for standard Greek fare. A few metres away, also overlooking bobbing boats, is casual Schooners Bar & Grill, a steak-and-seafood eatery with many beers and wines. Hanuman, arguably Darwin’s top restaurant, highlights Indian and Thai among Asian influences. (Super-fresh calamari marinated in a not-too-sweet chilli sauce proved memorable.) Tree Tops, famed for Mod-Oz fare, works wonders with barramundi and tempts with alfresco seating overlooking tropical gardens. Leaping lizards supply action on Darwin’s Adelaide River. It’s an activity taboo in some other states: hand-fed giant crocodiles jump dramatically from murky water to grab hunks of meat from lines. One-hour cruises are run by Adelaide River Queen Cruises (from $21). An on-land alternative: Darwin Crocodile Farm with 35,000 mean-looking monsters in residence. In town on a Thursday evening? Grab a cab to Mindil Beach Sunset Markets with 250 stalls (60 selling Asian food). A Sunday version (4-9pm) is smaller. A free day? Tiwi Islands day trips interact with Australia’s most artistic Aboriginal community, visiting painters, carvers and the famed Morning Tea Ladies of Bathurst Island (No.49 of AT’s 100 Great Things To Do In Australia You’ve Never Heard Of – click here for more). With more time – say, a weekend – explore Arnhem Land’s wildlife, wetlands and ancient Aboriginal rock art from a Mount Borradaile tented camp with Davidson’s Arnhemland Safaris; it’s a road-less-travelled than similarly memorable Kakadu or Katherine Gorge side-trips. The Museum & Art Gallery of the NT supplies a good exposition of the Territory’s past and culture, including modern history. Aboriginal art is prominent but another worthwhile venue is the Aboriginal Fine Arts Gallery. Mitchell St is dominated by a multicultural mix of backpackers and boisterous pubs such as faux-British Rorke’s Drift and faux-Irish Shenannigans, with Lewinsky’s a less frenetic venue for drinks as well as succulent steak or seafood (the other two have above-average pub-style menus). Alternatively, a five-minute cab ride reaches SkyCity with its customary mix of casino games, food-and-beverage options and occasional cabaret. 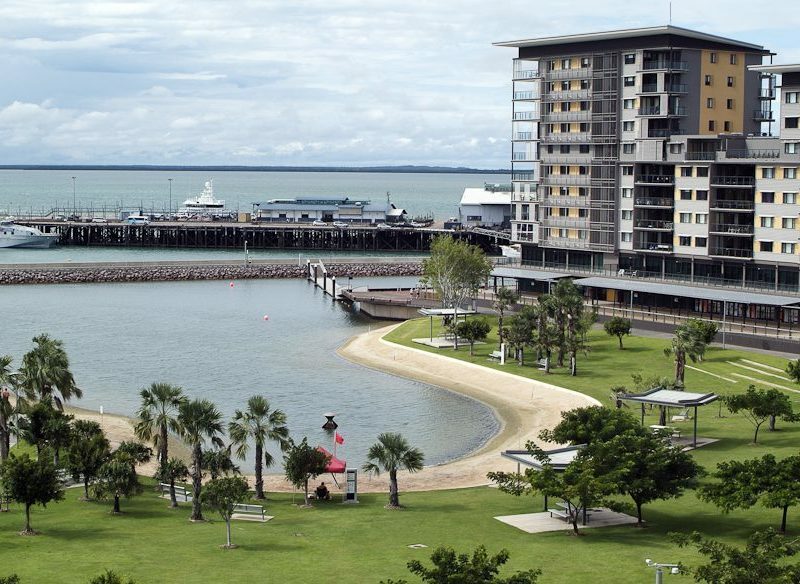 Cullen Bay’s marina precinct also presents several drinking-and-dining possibilities. Check what’s on at Darwin Entertainment Centre for classical music, jazz, pop, drama and musicals. 1. Parap Village Market (0438 882 373) on Saturday mornings is a locals’ favourite, less touristy than Mindil but crammed with aromatic Asian foods and arts-and-crafts stalls. 2. Smith St Mall gets a tad rough at night; Mitchell St and The Esplanade are far better options. While women in groups are commonplace in Mitchell St pubs, women alone may feel more comfortable at Cullen Bay. The cruise option below is particularly popular with female travellers. 3. Take a sunset cruise on Darwin’s harbour (top), with champagne and knowledgeable commentary. The appropriately named Champagne Sunset Cruises [(08) 8941 4000] is one of the best.